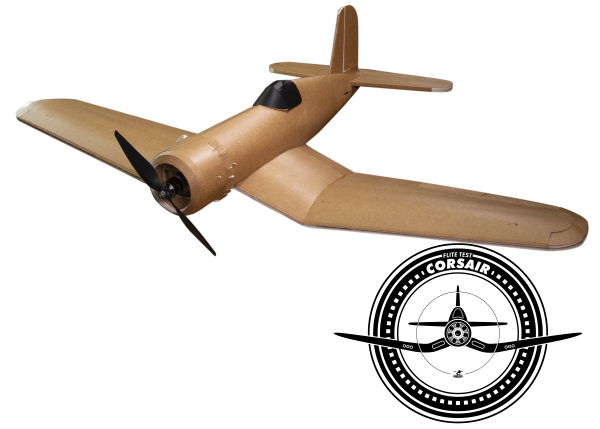 The FT Corsair represents a new chapter of Flite Test scratch built aircraft! Using techniques developed by John Overstreet which he has also used in his metalworking, this plane uses "mold together" techniques instead of the traditional "fold together" techniques that Flite Test planes are primarily known for. Peeling the paper and curving the foam not only gives the airplanes amazing scale looks but also makes it fly as good as it looks! On this Corsair, you'll notice the beautiful curves in the airfoil and the fuselage that is a result of some of the new techniques that we are introducing. While some of these techniques will feel new if this is not your first Flite Test build, please know that once you learn them, they will be carrying over to future Flite Test aircraft so you can put them to use on future designs. There are also techniques used in the build that you are going to be very familiar with if you have built previous Flite Test aircraft. This aircraft has a very wide envelope of speed and performance to match your skill level. Though this airplane does introduce some new build techniques you can consider it a beginner to an intermediate flyer! Bumping it up to a 4 cell battery can even give the most advanced pilots a great experience.